The Stone sculpture gallery of the Madras Museum has a separate section that houses carvings from the illustrious Vijayanagara era which began in 1336 C.E. in a place called Vijayanagara which is present-day Hampi on the banks of River Tungabhadra in Karnataka. This mighty empire, which at its height covered almost entire South India and beyond as well, left behind a great legacy in the sphere of temple architecture, sculpture and painting. Visitors to this section of the museum seldom pay attention to the relics on display here, though some of them are historically very important. One of these is a small image of Krishna as a child. There is a long history behind this sculpture finding a place in this museum. Krishnadeva Raya, one of the greatest rulers of India, undertook a military expedition against King Prataparudra of the Gajapati dynasty of Orissa. Having invaded the Fort of Udayagiri in 1513 and successfully captured it, he saw this image of infant Krishna (Balakrishna) and took it back to his capital, Vijayanagara. A large and grand temple for this deity was subsequently constructed in his reign in Vijayanagara to commemorate this victory. An epigraph of Krishnadeva Raya dated 1513 C.E. still seen in this temple states that this image of Balakrishna was brought from a temple in Udayagiri and consecrated in a large mantapa in the Krishna temple. In 1565 C.E. when the Vijayanagara army was defeated in the Battle of Talikota (Rakshasi-Tangadi), much of Hampi was destroyed. The ancient Balakrishna masterpiece which Krishnadeva Raya so dearly loved and which travelled from Udayagiri to Vijayanagara, was discovered by archaeologists in Hampi, identified as the one from Orissa, was taken to Madras and housed in this museum. This image of Balakrishna is unfortunately much damaged but even in this state, is still beautiful. 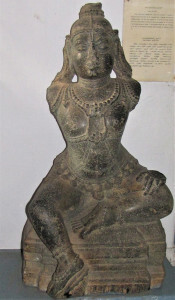 Other sculptures in this section include forms of Siva such as Dakshinamurti, Bhikshatanamurti (Siva as a mendicant, accompanied by a deer and a Siva Gana); Goddess Durga as Mahishasuramardini and a seated Vishnu. Apart from these, in a separate bay in the stone sculpture gallery are carvings which were found in the Telugu speaking areas of the Vijayanagara Empire such as Tadipatri in present-day Andhra Pradesh. Many of these areas had once been a part of the extensive Chalukyan Empire prior to Vijayanagara occupation. As the plaque in this section states, “The Vijayanagara Emperors adapted Tamil architecture and sculpture, spreading them throughout their dominions. But the sculptures of the old Chalukyan territory were deeply imbued with Chalukyan feeling, which inevitably found some degree of expression in their work”. 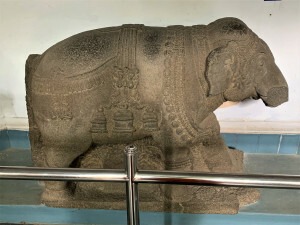 The carvings here include a large and well-sculpted stone elephant, decorated with bells, similar to the one seen in Hampi, especially in front of the famous stone-chariot of the Vittala temple on the banks of River Tungabhadra. Many other sculptures are broken pieces which once formed parts of gopurams in various temples. One depicts two warriors with upraised swords, standing next to huge elephants, one of them holding the tusks of an elephant. Another is of a male dancer, dancing with aplomb, right leg outstretched and flanked by two musicians, both playing on instruments resembling the present-day kanjira. Other decorative elements include decorative elements of a gopuram known in technical parlance as ‘kumbha panjara’, the base of which looks like a pot. Here only the pot-like carving is seen with beautifully carved parrots on either side. One of the eye-catching sculptures is that of a man standing with legs crossed and leaning on a stout stick. Bearded, with a gentle smile on his face, this person can perhaps be identified as a cowherd or a shepherd, patiently watching over the herd. Similar carvings can be seen in many temples of the Vijayanagara era in various places, especially in Hampi. Other than these, there are some copper-plate inscriptions of the Vijayanagara dynasty which are showcased in the copper-plate section of the same gallery.